Family members, including parents, siblings, and children, plus friends and neighbors, die without being assured of salvation in Christ. And it bothers the biblically-oriented Christian, both intellectually and emotionally, and so much so that some of us would like to ignore the doctrine of hell all together. Many religious people, including Bible-based groups, have simply done away with or otherwise muted the awfulness of the doctrine. For instance, Christian Scientists say there is no death at all. They hold to a monistic theology like that of Hindus and believe there is no external reality at all but only a single essence or consciousness. Jehovah's Witnesses and Seventh Day Adventists believe in annihilation with only the righteous surviving to a heaven or paradise. Mormons have levels of heaven, and everyone makes it to one level or another, thus avoiding the sting of hell completely. Some Christians, like Rod Bell, teach that a loving God will not send anyone to hell, that hell is reserved for only Satan and the demons. The Roman Catholic Church has a purgatory, which is neither heaven nor hell, and if the proper prayers are made and candles lit, a person can escape purgatory and make it to heaven. Or course, atheists simply believe the grave is the end. All very comforting indeed - or maybe not. Didn't Christians come up with the doctrine of hell in order to scare people into heaven? Or, didn't Constantine come up with the doctrine in the early fourth century? Maybe those Bible-thumping fundamentalists, out of nothing more than spite came up with it as a destination for all who disagreed with them? Maybe Paul distorted the loving teachings of Jesus? Or, does that vengeful God of the Old Testament delight in making the people He created in His image miserable? Where did hell come from? The answer may be rather astonishing. The last possibility above comes closest to the answer. Yes, it is God Himself who is behind it all, but not because he is an angry God, though He can and will be angry, but because He is holy. Holy - this is the key word. Settle back for a moment and consider the following argument. In Genesis 2:3 we first encounter the concept of holy: "So God blessed the seventh day and made it holy, because on it God rested from all his work that he had done in creation." In the passage it is not clear what holy means. Later on, during the time of Moses, God gave the Ten Commandments, and it became clearer what holy meant (see Exodus 20:8-11). Basically, on the seventh day no work was to be done. As time went on, the seventh day was set aside to worship the Creator. When Moses first encountered God in the burning bush of Exodus 3:1-7, God spoke to him: "'Do not come near; take your sandals off your feet, for the place on which you are standing is holy ground" (Exodus 3:5). Moses learned that God was associated with holy, and again in this passage, we do not find a clear definition of what holy means. In Exodus 19:6 God tells Moses that the nation of people he is leading is a holy nation. Now the entire people that will one day be called Israel is, in fact, holy. That nation belonged to God; it was set aside and treated differently from all the other nations. In Leviticus, the third book of the Bible following Genesis and Exodus, we find a clearer understanding of what holy means: "'For I am the LORD your God. Consecrate yourselves therefore, and be holy, for I am holy'" (Leviticus 11:44). Now it is announced that God Himself is holy. But more would be revealed about what that meant. In Psalm 24 of David, verses 3 and 4, the concept becomes clearer: "Who shall ascend the hill of the LORD? And who shall stand in his holy place? He who has clean hands and a pure heart, who does not lift up his soul to what is false and does not swear deceitfully." Not everyone, then, may come before or be in the presence of a holy God -only those who have clean hands, a pure heart, are not false, and speak the truth. Isaiah the prophet had a vision of the holy God some centuries after the days of David. He said, "I saw the Lord sitting upon a throne, high and lifted up; and the train of the robe filed the temple" (Isaiah 6:1). The majesty of God was overwhelming to the prophet, and he used the best words he could to describe the majesty of the holy One of Israel. There were also angelic beings in the vision, and they said to one another, "Holy, holy, holy is the LORD of hosts; the whole earth is full of his glory!" (Isaiah 6:3). Isaiah's response was, "'Woe is me! For I am lost; for I am a man of unclean lips, and I dwell in the midst of a people of unclean lips, for my eyes have seen the King, the LORD of hosts!'" (Isaiah 6:5). Isaiah understood what the prophet Jeremiah would one day declare: "The heart is deceitful above all things, and desperately sick; who can understand it?" (Jeremiah 17:9). Jeremiah found out what King David had discovered much earlier: "They are corrupt, they do abominable deeds, there is none who does good" (Psalm 14:1). God is holy and people are not. Paul understood this when he said, "For all have sinned and fall short of the glory of God" (Romans 3:23). Then, building off that truth, Paul wrote, "For the wages of sin is death, but the free gift of God is eternal life in Christ Jesus our Lord" (Romans 6:23). So we have the dilemma. A loving God, but a holy God as well, before whom no sin can come. Wherever God is, it is holy. Heaven, a term used to describe God's dwelling place, is therefore holy, and sin simply cannot come into His presence. And to make it plain that hell is not a doctrine originated by Paul or anyone else in the history of the Christian Church, Jesus said, some twenty to thirty years before Paul's writings, "These will go away into eternal punishment, but the righteous into eternal life" (Matthew 25:46). "Eternal punishment" - these are the difficult words, and Jesus made other statements that go to the same point. It is now that the ministry of Jesus can be more fully appreciated. Jesus, Himself without sin, takes on the sin of the predestined, elect, and called of God: "And those whom he predestined he also called, and those whom he called he also justified, and those whom he justified he also glorified" (Romans 8:30). Paul put it this way: "And you, who once were alienated and hostile in mind, doing evil deeds, he has now reconciled in his body of flesh by his death, in order to present you holy and blameless and above reproach before him" (Colossians 1:21-22). Jesus' work on the cross - taking our sin upon Himself, dying in our place, atoning for and covering our evil deeds and unbelief - makes us holy. Indeed, without holiness no one will see God (see Hebrews 12:14). So, since it is appointed that all will die, and we all know this, there then awaits a judgment at which a person is found holy or not. Those in Christ, whose sin has been covered in the sacrifice of Jesus on the cross, will enjoy fellowship with God forever. However, and it is a huge however, those who must stand before the holy God at the judgment with nothing to cover them but their own sinful unbelief must be cast into hell. There is no other way. If I were to fudge on the clear doctrine of Scripture in regard to the doctrine of hell that begins in Genesis and extends to Revelation, I would be guilty of providing false comfort. Those groups mentioned in the second paragraph of this essay are guilty of doing so. As generous as I would like to be I can state no less. Before I was a follower of Jesus I hated the idea of hell and thought it complete nonsense. 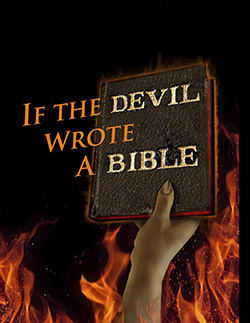 It was years into my Christian life before I realized that to be biblically faithful I had to admit hell as a reality. It did not settle easily on me, and at times I would equivocate. I will admit that I softened or blurred the doctrine on dozens of occasions and in numbers of sermons. I cannot undo the past, but I can speak the truth from here on out. Not all Christians believe in the actual reality of a hell. Having "correct" doctrine saved no one. We are saved by grace and not by works, a fact of which Bible-literate believers are fully aware. The purpose of this essay is to show where the doctrine of hell comes from: the holiness of God. Holding to an "eternal punishment" is perfectly acceptable and nothing to be embarrassed about. And when Christians speak of that final dread reality for those who are not in Christ, it must be with humility and a sense of sadness. Being glad that people are on their way to a final and everlasting separation from the Creator has no place in the heart and mind of a follower of Jesus. Finally, let me ask those who are offended at the doctrine of hell and thus reject it as authentic biblical truth - on what authority can we do so? Shall we go along with those whose agendas are not biblical? Can we side with those who are embarrassed at the doctrine? Are we not able to withstand rejection for the cause of Christ? Are we so unable to withstand the ridicule of others that we go along to get along? I had to face these questions once, and sometimes side stepped them. I refuse to do so any longer. Our God is a holy God, and we are made holy only in, by, and through our Savior, Jesus Christ.